Archiv Produktion provide five more of Vivaldi�s late violin concertos all said to be world-premiere recordings. Carmignola and Marcon with their Venetian orchestra have since 2003 recorded exclusively on Deutsche Grammophon�s Archiv Produktion label. This issue follows on the heels of their three Sony Classical releases in the Vivaldi series of The Four Seasons SK 51352 and two albums of previously �unrecorded� Vivaldi concertos on SK 87733 and SK 89362. I believe this may prove to be the golden age for recordings of period-instrument Vivaldi. Undoubtedly the earlier pioneering interpretations of Vivaldi and late-baroque music in general using period-instruments were dictated by the severe limitations of their instruments. These must have felt so confining to the players; as if they were all wearing strait-jackets. Consequently the performance style often came across as technically mechanical, rather lacklustre, frequently insipid and even sterile. A new generation of specialist performers, such as these explore and exploit the strength of their period-instruments rather than being restricted by the weaknesses. They are one of several outstanding specialist period-instrument ensembles that have come to prominence at the cutting-edge of the late-baroque scene in the last ten or so years. Other notable specialist period-instrument ensembles who have produced excellent Vivaldi recordings include: the Concerto Italiano under Rinaldo Alessandrini; Europa Galante under baroque violinist Fabio Biondi; Arte Dei Suonatori under Rachel Podger on baroque violin; L'Arte dell'Arco under baroque violinist Federico Guglielmo; Ensemble Explorations under baroque cellist Roel Dieltiens; the Freiburger Barockorchester under baroque violinist Gottfried von der Goltz; The English Concert under baroque violinist Andrew Manze and baroque violinist Viktoria Mullova with Il Giardino Armonico under the direction of Giovanni Antonini. 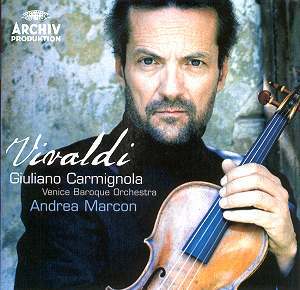 Treviso-born Carmignola has been a professor of violin at the Venice Conservatory for over a decade. He is a leading exponent of the baroque violin style, particularly in Italian music of the 18th century. He is a stylish player; as stylish as the fine Romeo Gigli suits that he wears. Without any hint of pretentiousness professor Carmignola�s playing is classy and sophisticated with an innate serious professionalism, as displayed at a 2002 BBC Proms concert when disturbed by noise from a member of the audience he turned around and glared towards the perpetrator. Founded in 1997, with some of Italy's finest instrumentalists, the Venice Baroque Orchestra are directed by baroque scholar, organist and harpsichordist Andrea Marcon who leads the continuo. The Venetian orchestra focuses on Italian music of the seventeenth and eighteenth centuries, and the ongoing rediscovery of Italian Baroque opera. Some two hundred and fifty of Vivaldi�s scores are violin concertos, making up well over a third of his prolific work-list. Apparently there are still a number of these that have not yet been recorded and this release includes claims for five such works. Vivaldi�s scores are all preserved in complete and reliable manuscripts in the massive collection at the Biblioteca Nazionale Universitaria of Turin and in every case have been published in a modern edition several decades ago. Vivaldi biographer Michael Talbot informs me that he believes there is no special reason why these concertos should not have been recorded previously; if that is actually the situation. The diversity of Vivaldi�s writing is astonishing: the Violin Concerto RV 217 begins with a fugato and RV 325 exploits the device of echo effects. The opening tutti of RV 190 recalls a French overture with its dotted rhythms, while containing a highly contrastive episode in C minor which, remote and contemplative, is not taken up again in the course of the movement. Elsewhere, Vivaldi creates a chiaroscuro effect by his use of modal harmonies in the ritornellos of RV 190, 217 and 331. In RV 190 and 217 he avails himself of contrasting tempos, and in RV 325 he tricks the listener with his extreme modulations. In the ritornello of the final movement of the RV 217 he creates the effect of pealing bells by means of a rapidly repeated syncopated note at the fifth, an idea also found in his cantata RV 682 in a passage that describes a desperate lover who despairs of seeing his constancy rewarded. Vivaldi�s variety of accompaniments are also remarkable, the rhythmic invention, such as the triplet passages in RV 190, the many accents on the weak beats and, the extraordinary technical range of the soloist�s part, in which right hand and left hand alike are exploited to the full. These technical complexities culminate in RV 190 and 331, whereas the other concertos reveal a more clear-cut character: with its two movements marked Allegro molto, RV 325 suggests both exaltation and challenge, while RV 217 is theatrical, a buffa piece at the very limits of virtuosic and emotional grotesquerie. RV 303, finally, is markedly rustic in tone. At ease with the technical demands of these scores Carmignola clearly loves this music and plays with a controlled power and expression expertly blended with a certain panache. The allegro movements are played with a smouldering vitality and an impressive boldness, yet constantly remaining stylish and polished. In Carmignola�s hands the slow central movements are lyrical and highly appealing, akin to sacred meditations with several episodes of outstanding beauty. These are interpretations that never over-characterise Vivaldi�s exciting range of emotions. Carmignola�s security of technique is astonishing and his 18th century anonymous Italian violin provides an attractive silvery tone. The soloist and the Venice Baroque Orchestra demonstrate that they have reached a supreme solidarity of ensemble. I was impressed with the colour and variety of Andrea Marcon�s continuo realisation with the harpsichord employed together with the lute. The engineers are to be congratulated for providing a well balanced sound that is cool and clear. The high standard liner notes add to the excellent presentation of the release. Vivaldi lovers will not want to be without this beautifully performed and recorded release.